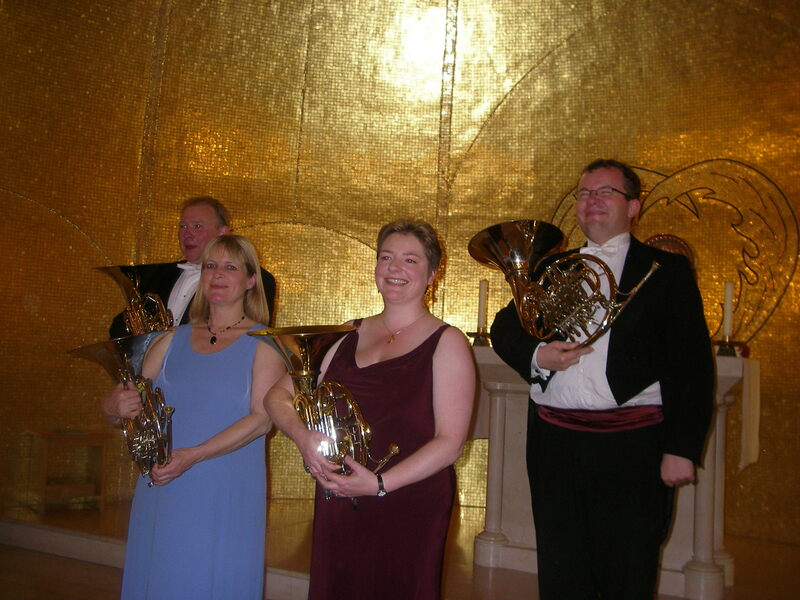 Covent Garden Chamber Orchestra concert, Saturday 4 October – especially the Schumann Konzertstück for four horns, magisterially played by Richard Lewis, Jo Towler, Duncan Gwyther and Liz Kadir. Wow. Haydn’s Creation at the Korean Full Gospel Church in Raynes Park, Sunday 12 October – lots of fun, the Koreans charming and lovely, my contra bottom B flat much appreciated! The English Chamber Orchestra at Cadogan Hall, Wednesday 15 October – Tippett, Britten (Les Illuminations with stunning young soprano Mary Bevan), plus some works by Arab composers including the brilliant and hilarious Saxophone Concerto by Waleed Howrani – a perfect Last Night of the Proms piece? 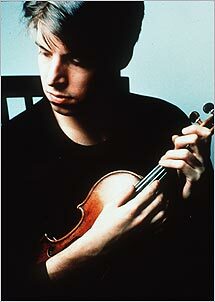 And the Brodsky Quartet at Cadogan Hall on Wednesday 29 October – Beethoven Razumovsky No. 1 (what a wonderful piece), Tchaikovsky Quartet No. 1, and two little Stravinsky numbers (Concertino and Three Pieces) which were spellbinding. Normal service one of these days! The Burghers of Blackheath did themselves proud this morning – so many tickets sold for Nikolai Demidenko’s Blackheath Sunday recital that they had to move the gig downstairs into the Big Hall. Or was that just a pretext to hire in a big clangy Steinway (I guess) and leave the lovely little Bösendorfer sulking upstairs? I am forever grateful to the Powers that Be for setting Beethoven’s so-called ‘Moonlight’ Sonata, Op. 27 No. 2, on our O-level syllabus a hundred years ago – so I know it well, or so I thought. Nick Breckenfield’s fascinating programme note dismissed the ‘moonlight’ tag, but revealed that the first movement is a meditation on the music for the death of the Commendatore from Mozart’s Don Giovanni, a fact which I certainly had not come across before. This makes sense of the Sonata’s subtitle – ‘quasi una fantasia’: meaning not ‘an apology for not being in the sort of sonata form you’re used to’, but ‘like an improvisation’ on an idea by Mozart. An illuminating insight into Beethoven’s creative processes. A friendly Burgher of Blackheath (who shall be nameless) was absent, as she’d been to a previous recital by Demidenko and said she couldn’t stand the way he played – he ‘bashed the hell out of Schubert’. In the first movement of the ‘Moonlight’, my worst fears seemed to be confirmed. The sound was dry, too loud, and broken up by little hesitations before barlines or even beats – the opposite of the constant flow of triplets the music surely needs. I guess (I couldn’t see his feet) that Demidenko was using hardly any pedal – in contradiction of Beethoven’s instruction to play ‘without dampers’, i.e. with the pedal down all the time (which admittedly wouldn’t work on a resonant modern piano, producing an impossibly muddy effect). Not pleasant. Wait a minute, you say… that was way back, during the War, wasn’t it? Well… Myra Hess has been brought back to (sometimes disconcertingly vivid) life, through the efforts of The Pianola Institute, in the persons of Denis Hall and our dear friend Rex Lawson – presiding modestly over the proceedings in their immaculate white tuxedos. Tonight’s recital took place in the very room where Dame Myra gave her legendary wartime concerts, the octagonal Room 36 under the central dome. 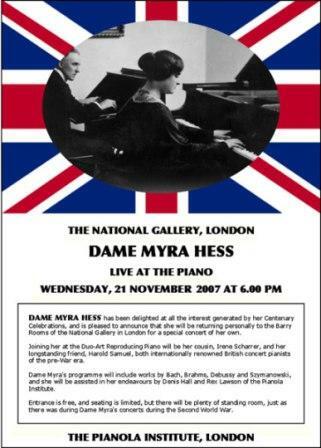 Amazing sense of being in the presence of history – especially as the small but enthusiastic audience included some venerable guests who had known, and even performed with, Myra Hess; and one grand old lady (we think Carola Grindea?) who persuaded her not to lock up her piano for the duration of the War, but instead to use her talents as a pianist to raise the nation’s spirits (rather than driving an ambulance ‘which other people can do’). With their impressive Duo-Art Pianola hooked up to a Steinway grand (the ‘pianola’ being a Black Box with 88 robot fingers pressing down the piano keys, and presumably with some robot toes for the pedals as well), Rex and Denis treated us to a feast of original piano rolls recorded by Myra Hess and her friends and colleagues – including Harold Samuel, Harold Bauer. 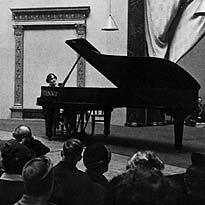 and Myra Hess’s cousin Irene Scharrer (whose two electrifying Chopin Etudes were the highlight of the evening for me). Dame Myra herself played Bach, Scarlatti (arr. Dukas! ), Debussy and Szymanowski, and half a twee duet by ‘Burgmein’, who turned out to be the Italian publisher Giulio Ricordi hiding behind a pseudonym. How’s this for synchronicity? Two nights ago I was writing up Joshua Bell’s recital (see my previous post) and had a rant about Harold Bauer’s ‘rewriting’ of the Schumann violin sonatas. Lo and behold, tonight we had Harold Bauer ‘in person’ playing a Schumann Novelette – introduced by Denis Hall saying that Bauer had published a complete ‘improved’ edition of Schumann’s piano music, which was still worthy of pianists’ attention today. Hmm. Still, the playing was impressive. All did not go quite according to plan: Joshua Bell (along with several of the audience) apparently thought the concert started at 7.30, not 7, so it was getting on for 7.20 when a slightly dishevelled-looking figure finally came on to the Cadogan Hall stage, along with the more impeccably turned out pianist Jeremy Denk, both dressed all in black and looking somewhat like a couple of über-cool twelve-year-olds. Things were further muddied by a misunderstanding which had led all of us (including me, writing the programme notes, and poor Lisa at the Hall who booked him a year ago) to think he would be performing the Sonata by John Corigliano (1964), whereas Mr Bell insisted he was playing Grieg’s Sonata No. 3 instead. His rather garbled explanation did little to clear things up. Anyway, all negative impressions were erased when they started to play. The Schumann Sonata No. 1 was terrific (a little early scratchiness aside), charged with energy and understanding, the beautiful conversational middle movement full of intimacy and wit. (Amazing that in 1945 Harold Bauer thought it necessary to ‘improve’ Schumann’s violin sonatas, correcting perceived errors in balance, texture and dynamics and even ‘touching up’ the harmony. Even more amazing that, as recently as 1972, John Gardner commends these versions to performers ‘for serious consideration’ [in ‘Robert Schumann, the Man and His Music’, ed. Alan Walker, Barrie & Jenkins 1972].